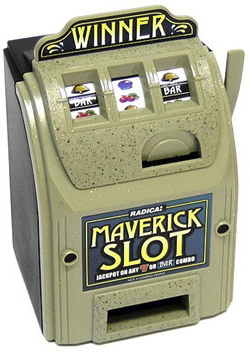 This is a Radica Maverick Toy Slot Machine Bank that will be a hit for the slot player you have in mind. Accepts 95% of world coins with a separate jackpot coin slot for realistic play and a saving coin slot. The reels actually spin and if you are lucky enough to hit the bar/seven combination, get ready for a pay out. This can be a fun gift for both youngsters and oldsters. At 6.25 inches tall and 3.5 inches wide, it will fit perfectly just about anywhere you want to put it and it mimics real slot machine play perfectly. It does not require batteries so there are no worries about having to buy them constantly.